4502 X-Wing Fighter is a LEGO Set from the Star Wars theme released in 2004 as part of the Star Wars: Episode V The Empire Strikes Back line. Included are Luke Skywalker, R2-D2, and Yoda minifigures. The X-Wing has a gear that allows you to move the wings up and down. The hut contains a bed, a glass, and a secret compartment. The X-wing fighter was utilised by the Rebel Alliance throughout the original Star Wars trilogy. Luke Skywalker crashed this X-Wing fighter on Dagobah finding Master Yoda, who taught him how to use The Force and lightsaber skills. This was long the only set that contains Yoda's hut, until the release of the dedicated 75208 Yoda's Hut set. This X-Wing is very similar to 6212 X-wing Fighter. This set saw the only appearance of Luke Skywalker (Dagobah). This is the first and only set to have Yoda that is based on The Empire Strikes Back. This is the only X-wing to have foliage on it. This is a description taken from LEGO.com. Please do not modify it. Fly the X-wing to Dagobah! Luke Skywalker has piloted his X-wing fighter to Dagobah to learn the secrets of the Force from Yoda! Can the Jedi Master train Luke in time to stop the Empire from defeating the Rebels? Will Luke master the Force and be able to raise his X-wing from the swamp? The choice is yours when you build this exciting new set, featuring the X-wing, Yoda's house on Dagobah, Luke Skywalker and Yoda. Recreate these classic scenes from Star Wars: Episode V The Empire Strikes Back, or tell your own adventure story on the swamp world of Dagobah! Facts about "4502 X-Wing Fighter"
Fly the X-wing to Dagobah! Luke Skywalker has piloted his X-wing fighter to Dagobah to learn the secrets of the Force from Yoda! Can the Jedi Master train Luke in time to stop the Empire from defeating the Rebels? Will Luke master the Force and be able to raise his X-wing from the swamp? 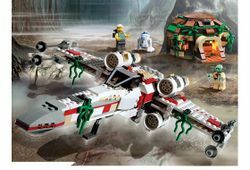 The choice is yours when you build this exciting new set, featuring the X-wing, Yoda's house on Dagobah, Luke Skywalker and Yoda. Recreate these classic scenes from Star Wars: Episode V The Empire Strikes Back, or tell your own adventure story on the swamp world of Dagobah! This page was last edited on 12 January 2018, at 02:10.